Sorry about the delay in posts - I've been very busy lately, but will be blogging back to normal next week! Here's a quickie about some sweet treats I bought for a couple of friends last week. With so many cupcake bakeries popping up in Melbourne, I couldn't help but fall into the craze and found myself at Little Cupcakes. 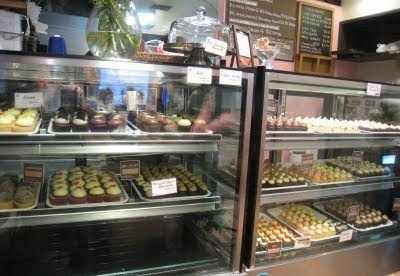 There is just something so tempting and delectable about each perfect little cupcake, resting so innocently in its neat row within the glass cabinet. At only $2.50c for a miniature sized one, I feel very proud to have resisted from buying every flavour on offer! Cute Box of Little Cupcakes, Big on Flavour!